Born Oct. 8, 1861, in San Francisco, CA. Cigar chewing Theodore Roberts was also a veteran of the stage, which is where he and Wallace Reid became good friends. Roberts worked in support of Reid in many of his pictures including "Nan of Music Mountain" (1917), "The Source" (1918), "The Roaring Road" (1919), "Hawthorne of the U.S.A." (1919), "Double Speed" (1920), "Excuse My Dust" (1920), "Too Much Speed" (1921) and "The Affairs of Anatol" (1921). Roberts gives one of his trademark performances in "The Roaring Road" as J.D. "The Bear" Ward. He provides the perfect antagonist for Reid constantly snarling and chewing on a cigar impatiently with smoke billowing around his head. A Motion Picture Magazine review of the picture said, ". .. according to the number of close-ups of Theodore Roberts smoking a cigar, I should say it was starring a new brand of tobacco." Photoplay said, "Theodore Roberts is excellent as the blustering J.D. . . ." Around this same time, Roberts was being used by Cecil B. DeMille in some of his most popular films such as "Don't Change Your Husband" (1919) and ""Male and Female" (1919). In the latter, he still has the cigar, but, in contrast to his aggressive character in "The Roaring Road," he plays the passive Lord Loam who lets his daughters (played by Gloria Swanson and Mildred Reardon) rule the roost. When they are all stranded on a desert island, he willingly concedes to rule by his butler (played by Thomas Meighan). He does add a comical touch to the film, though, such as the scene where the shipwrecked party panics when they see something rustling in the undergrowth. While the women recoil in fright and the men pull out their firearms, out comes Roberts, whom they had presumed dead in the shipwreck, on hands and knees - still in his bathrobe, glasses down on his nose, and, of course, the ubiquitous cigar clenched tightly in his teeth. The role by which Roberts will be most readily remembered is as Moses in DeMille's "The Ten Commandments" (1923). It is a tribute to this old veteran's talent that he could play the clueless patriarch four years earlier in "Male and Female," and turn in a first-rate performance of dignity and earnestness in this Biblical epic. Of course the make-up helped, but it's hard to believe this is the same actor who did such comedic roles as he did in "The Roaring Road" and other films. 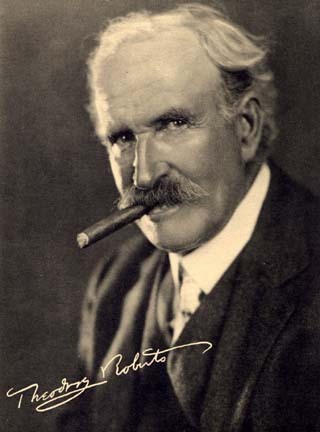 A December 22, 1923, New York Times review said of Roberts' performance, "Theodore Roberts, who recently was seen in the character of a businessman with a cigar in his mouth, gave an excellent portrayal of Moses, the Lawgiver. His make-up was faultless, and the sincerity with which he acted this part made the whole affair doubly effective. " Roberts' health began to go downhill in the mid-twenties, and his his film work was reduced accordingly. He didn't make a single picture in 1924, only one each in 1925 and 1926, and two more in 1928. He died December 14, 1928, at the age of 67 in Hollywood probably depriving the coming sound era of one of the best character actors ever.